Costco's business model derives no material operating profit from the retail sale of merchandise. Virtually all operating profit comes from gross membership fees. Membership fees will grow irrespective of the economic cycle and competitive landscape provided that membership has a perceived value to customers. 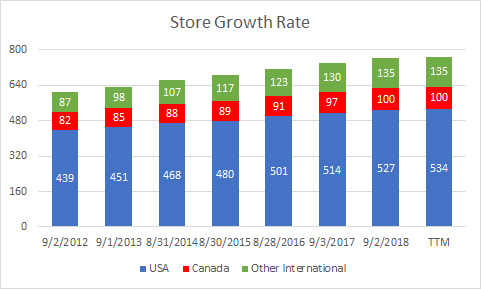 At the current rate of store expansion Costco has multiple decades of growth runway both domestically and internationally. Some variation of the chart above has found its way into several articles, and for good reason! 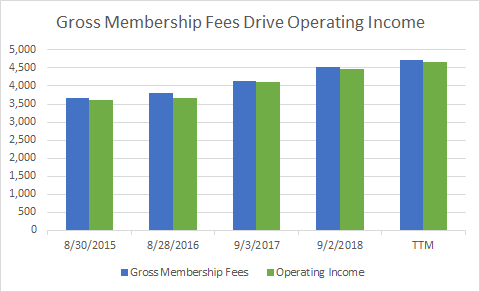 The relationship between membership fees and operating income is about as strong as one will ever find in the real world -- the R-Squared, measuring the statistical correlation between the two metrics, is an astounding 0.976. 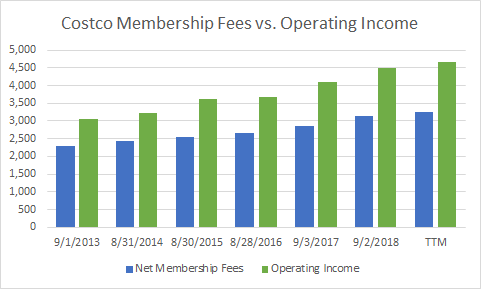 But this relationship is actually even stronger than the headline numbers suggest due to how Costco management chooses to calculate and disclose membership income. For Fiscal 2018 gross profit as a percentage of merchandise sales (merchandise sales - COGS divided by merchandise sales) was 11.04%. The SG&A rate, including both fixed and variable components, was 10.02%. Lastly the amount Costco gave back to members in rewards rebates amounted to 1.01% of retail sales. Add it all up, and the net operating profit from these items actually rounds up to 0.01%, or less than a penny per $100 of sales. In raw dollar terms it was $12 million dollars on merchandise sales of $138.4 billion dollars in Fiscal 2018. This relationship wasn't a fluke either. Over the past four years, the cumulative operating profit using the above methodology is $31M on a sales base of nearly $500B! Given the volatility in foreign exchange rates, fuel prices and fuel cost, and stock compensation which is partially dependent on the daily swings in the stock price, that $31M of profit over the last 4 years is essentially rounding error. The trend is continuing through the first two quarters of Fiscal 2019 as well with the overall net change in operating profit excluding gross membership income is up a measly million dollars (likely rounded) on a change in merchandise sales of over $5.5B year over year. Investing in new stores which are incrementally unprofitable in the short term immediately after opening, particularly in new markets where administrative and distribution infrastructure also has to be built out. Because management is so good at managing and forecasting each of these pieces along with projecting sales levels, they are effectively able to run the business at zero marginal operating profit as a percentage of retail sales. The investment implications are profound. Strategically, it means that their efforts at growing online sales to compete with Amazon and other retailers is an exercise in customer satisfaction and membership retention rather than one that will lead to higher sales, market share, and operating profits. It also means that Costco's P/L is immune to economic shocks such as recessions that lead to a drop in consumer spending. The bottom line for investors: as long as customers continue to find their membership valuable and membership levels don't fall, the retail sales volume and the channel of that sales volume becomes irrelevant to the investment thesis. The singular lens by which investors should evaluate Costco's future prospects, both competitively as well as economically, is membership levels. The only metric that matters is gross membership income. Note that gross membership income isn't technically disclosed anywhere in the filings. It's computed by taking published net membership income and adding back the contra-revenue item of membership rewards expense disclosed in the 10K's and, beginning in fiscal 2019, the 10Q's. Additionally, operating income also includes pre-store opening expense that is not included in SG&A. If one were to exclude the store opening expenses, the two lines are even closer together and the relationship is even stronger. The R-Squared between the two is an astounding 0.983 over the previous 4 years. 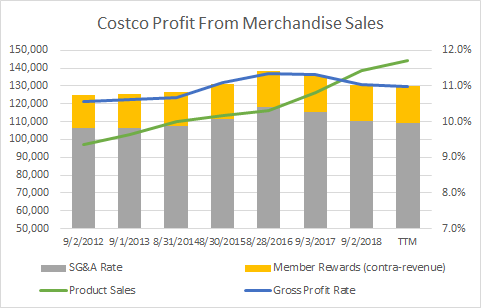 It's blindingly clear that if one wants to understand Costco's business performance, all one needs to do is look at the metrics that contribute to gross membership income. Sources: company filings and author's calculations. In terms of future growth, let's look at each one of these components individually. For store openings, the growth rate since 2012 has been a CAGR of 3.75% annually, although that figure has come down in recent years as the number of new stores has remained relatively constant in raw absolute numbers while the total store base has continued to grow. On a go-forward basis, there is tremendous opportunity to increase the number of stores. Costco only has 534 stores domestically, but that pales in comparison to other big-box stores such as Wal-Mart (5,300+ including Sams Club), Target (1,845), and Home Depot (1,981). On the international side of the business, Canada (100) is pretty well saturated as is Mexico (39 locations) given their middle class populations. The rest of the world has less than 100 stores combined, but the business model has proved to work in multiple countries with extremely diverse cultures. This fact is crucially important in the retail sector where many successful domestic retailers have failed to successfully export the North American business model to Europe or Asia. That Costco has been able to expand, presumably profitably, in such diverse places as Japan, South Korea, Taiwan, Australia, and the United Kingdom suggests that the business model will have a good chance of being profitable in every developed market with a sufficiently large middle/upper class population. Costco currently has two stores in Spain, one in France, and will be opening their first store in China later this year. Additional markets that are significant opportunities include: Germany, Italy, Switzerland, Austria, Ireland, Belgium, Netherlands, Norway, Sweden, Finland, Portugal, Brazil, Argentina, Philippines, Singapore, Malaysia, Vietnam, Thailand, and India. At the current pace of store openings, it will take Costco many decades before all of these markets are saturated, and perhaps by that point there will be additional countries to add to the list that are presently not worthwhile. My working assumption is that Costco could eventually have 1,000+ stores domestically and 2,000+ stores internationally. Assuming 75K paid members per store (see below), that would imply market penetration of 75M domestic households -- or approximately 60% market penetration based on current population -- and another 150M paid member households outside of the United States. However given the pace of store expansion and the time required to reach these figures, these estimates may prove to be conservative once middle class population growth, particularly in China and the rest of Asia, is factored in. 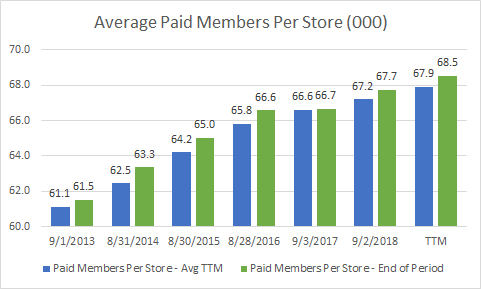 With respect to the average number of paid members per store, the growth rate has been approximately 1.9% for the past 5 years. Recent results suggest this figure can and will continue to climb, but there is a limit to how high it can go. With too many members at a given location, shopping becomes an unpleasant experience and membership renewal rates can become an issue. Management has addressed this by opening up additional stores in existing markets to make shopping more convenient both by reducing the crowds in existing stores as well as reducing the average travel distance for customers in those markets. I am hesitant to project more than 75K customers per store until evidence emerges that the figure can go higher than that. The average price per membership has multiple components to it. The first factor is the price in local currency for each membership type. Historically, Costco has increased pricing in increments of 5 or 10 units in the local currency, and they have done so every 4-5 years. The result is lumpy price increases that are approximately equal to the rate of inflation over the medium and long term. The second factor that impacts the average membership price is the mix of gold vs executive membership tiers. There is no hard data on this metric anymore, although management used to disclose it many years ago. It is also important to note that Costco does not offer executive memberships in every country, but that is a dual edged sword -- as international growth accelerates, the average price will naturally come down due to unfavorable gold/executive mix, but management could in theory introduce the executive tier in more saturated markets to drive a richer mix of memberships in the future. Lastly, movement in foreign currency exchange rates has had a material impact on consolidated results, but again this hasn't been quantified by management with specific reference to gross membership income (it has been disclosed with respect to total revenue, but that may not be indicative of membership income due to regional differences in merchandise sales per member, rewards rate, and membership pricing differences between countries). 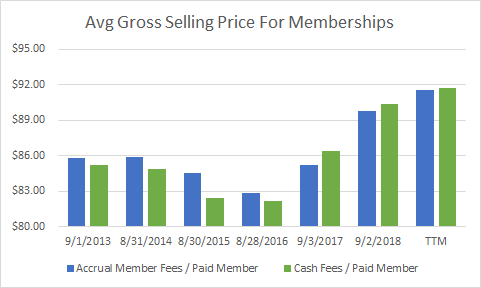 All-in, the average price per membership has increased at approximately 1% CAGR for the last 5 years. Moving forward I think 1% represents a reasonable target. Local currency pricing should increase at 1.5%-2.0% per year, but there will be negative offsets to that related to international mix (lower pricing) and potentially a strengthening dollar over the long term. Taking all of these factors into consideration, it's clear that Costco represents a very low risk long term investment with significant upside potential. The business is insulated from both competition and economic shocks provided that members continue to find value in their membership. Costco has one of the lowest cost structures in the retail industry. When coupled with their pricing strategy of zero profit on incremental merchandise sales, the result is a recipe for continued and steady growth long into the future. That said, investors should probably expect the growth rate to moderate somewhat from the 8-12% rate of the past two years which was impacted by the 9% membership price increase in the United States. The next 2-3 years may see minimal, or perhaps even negative, changes to effective average membership prices. Longer term it's reasonable to expect 3% store growth, 2% membership/store growth, and 1% price per membership growth, or approximately 6% compounded operating income growth per year. Lastly, investors should still be aware of the monthly and quarterly sales reports and use them as an opportunity to fade the market when the stock price overreacts to unexpectedly high or low same store sales reports. And while some investors may find the valuation of the stock to be unattractive on a P/E or EV/EBITDA basis, the stock should continue to command a premium valuation as long as there is significant growth potential, and there is the possibility that the stock rerates higher if management accelerates the pace of store openings. Regardless, given the relatively slow pace of store openings in conjunction with just now entering the Chinese and mainland European markets, Costco easily has multiple decades of store expansion in front of it and could likewise eventually double their store footprint domestically.